Despite heavy opposition, Macon’s planning and zoning commission voted Tuesday to rezone 25 acres on Zebulon Road to allow a $30 million shopping center in a residential area. The opposition included petitions signed by about 250 people, numerous personal letters and about 150 people who crowded into Macon City Hall council chambers. 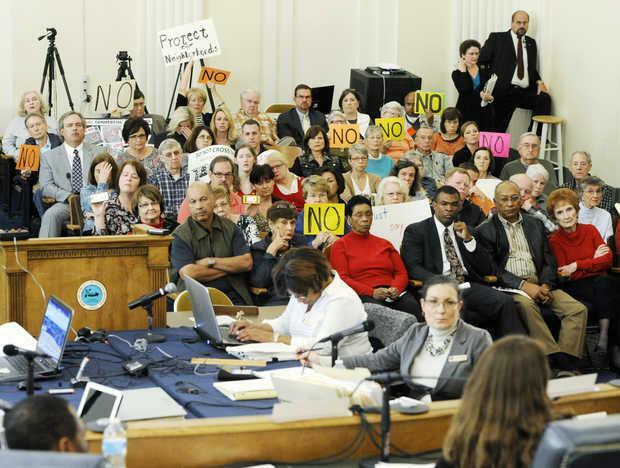 Many of those in attendance displayed signs urging commissioners to vote no. Commissioner Al Tillman made the motion to approve the rezoning application. An amendment will require a new site plan by the developer. Commissioners Tillman, Kamal Azar and Bryan Scott voted for the rezoning with commissioners Sarah Gerwig-Moore and Jeane Eason voting against it. 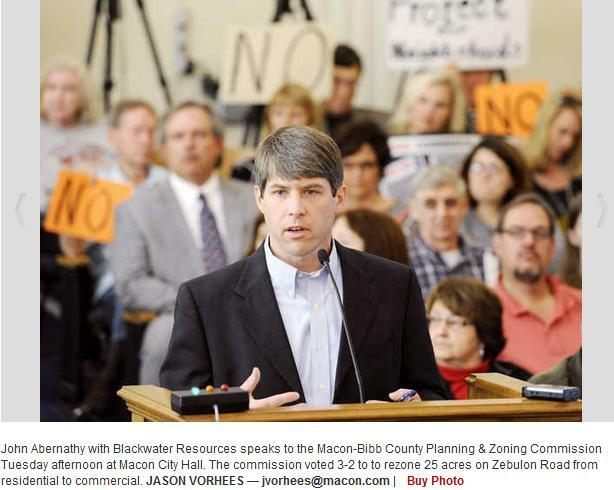 Birmingham, Ala.-based developer Blackwater Resources applied to rezone seven contiguous properties between 5801 and 5885 Zebulon Road. The company plans to build a shopping center with 200,000 to 250,000 square feet of retail space including five outparcels. Blackwater is developing this project under the name Development Co. LLC. John Abernathy, director of development and leasing for Blackwater, said the project would create 350 to 500 jobs. He said he expects a speciality grocery store to anchor the shopping center. The commission first heard the Zebulon rezoning issue Oct. 28, but the hot-potato issue was deferred at the request of Abernathy who presented a revised preliminary site plan Tuesday. 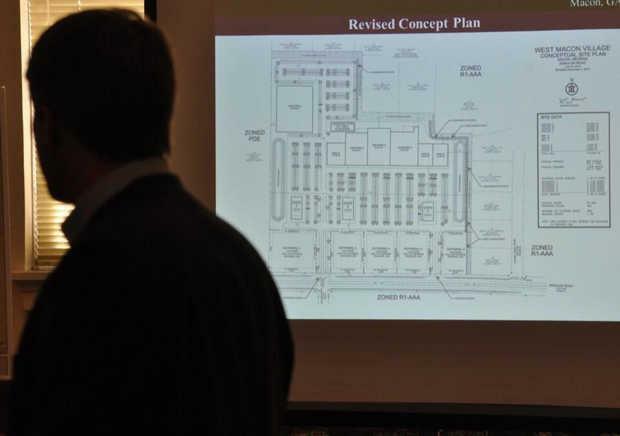 The new plan increased the buffer at the rear of the proposed center from 20 feet to 40 feet. Also, instead of having one retention pond, the plan showed two smaller detention ponds on the east and west property lines. Abernathy said a fence could be added between the shopping center and adjacent residential properties. The rezoning would not set a precedent for future zoning along Zebulon because there is no other property similar to the seven parcels to be developed for the retail center, he said. 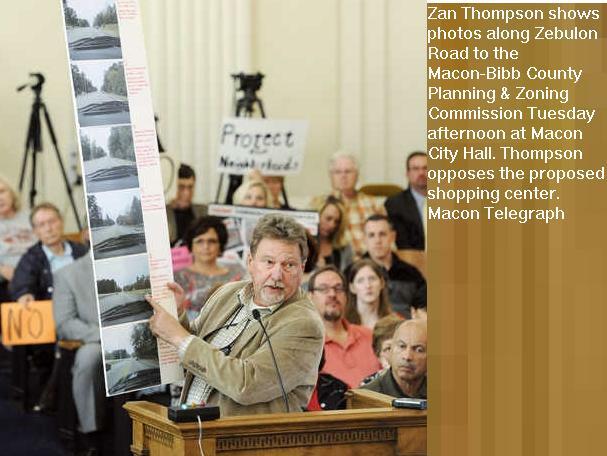 Zan Thompson, land planner and owner of ZT3 Placemaker Studio who was hired by some opponents of the proposal, said the center would not work. Blackwater asked for the property to be rezoned from a residential district to a planned development district, which is designed for mixed uses. However, Thompson said, the proposal included retail and did not include residences or office space. 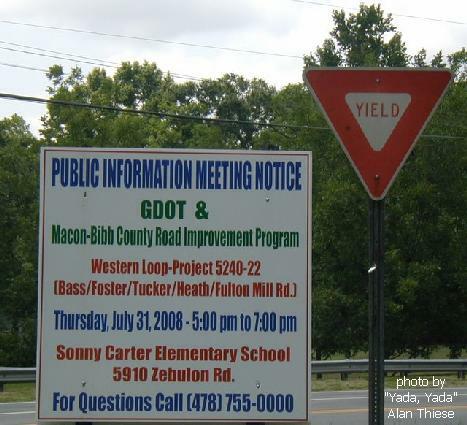 He pointed out that for about 20 years the commission has denied nearly all zoning permits for project along Zebulon Road east of Sonny Carter Elementary School and Northway Church. The two institutions have served as a transition between large retail shopping centers to the west and residential neighborhoods to the east. The placement of the church and school was intentional, and “it’s a sign of good planning, not bad planning,” Thompson said. Commission members questioned Abernathy about adding a residential element to the project so it would better fit the requested zoning. Azar said the property could be developed as a small neighborhood village center with proper buffers. “We are willing to commit to a residential component if approved,” Abernathy said, but he didn’t know if the project would be feasible if it was smaller. Gerwig-Moore said she was concerned about the property being rezoned without an acceptable site plan. After the vote, the obviously disappointed crowd left the meeting. 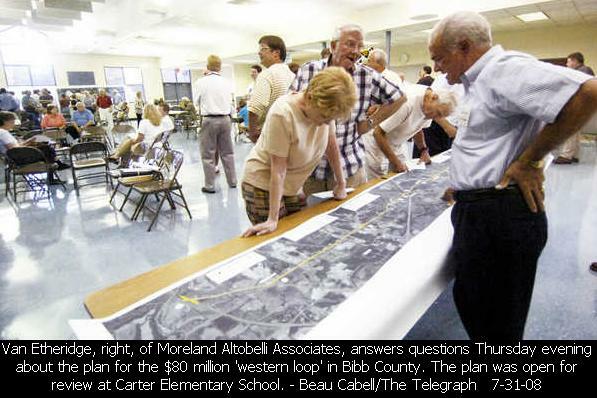 “Clearly the planning and zoning board had concerns about the plans presented,” said Glenn Smith, who lives on Zebulon and has opposed numerous proposed projects along the residential section of Zebulon Road over the years. Abernathy said after the meeting he was committed to working with the zoning commission to make the development more of a mixed-use project with a residential component. He expects to have finalized plans within three or four months. However, the process may be held up. I thought the petition in opposition was signed by 550, note 250, but perhaps I misheard. I will say that I do not understand the point of rezoning the property without a viable plan. The developer admittedly did not want to include residential or reduce the size and agreed to "consider it" only in order to obtain the rezoning. He pushed his open date to 2017, when I'm sure he's hoping to have a different commission who will approve whatever plan he presents. What I found most interesting, and isn't really mentioned in this article, was the issue with the out parcels. It seemed to me that the commission was very much against out parcels, and the developer point blank stated that he couldn't develop the property without those. A lawsuit at this point is a guarantee and everything seems to have been a waste of time and money since no one (the community, the developer or the commission) is happy with what has been done. And Al Tillman is an idiot if he doesn't believe he has just robbed his new constituents of their jobs and money over on Eisenhower. There is no way that the development doesn't include draining that side of town. But seeing as he intentionally ignored parts of the meeting yesterday I'm sure he didn't catch that. I am not surprised. A developer from not just out of town, but out of state. Where will the workers come from? Will it strengthen Macon's economic base? I did not hear or read any of this in the discussions. Everyone who opposes it and those who live around it can boycott it. Until folks start this practice, things will never change. Just my opinion for what it's worth. Did some money change hands under the table? That SHOULD be all you need to hear to kill the project... but when a developer is involved, forget it. The developer nearly always gets their way. The almighty dollar wins again folks. Move along citizens, nothing to see here. thank god it finally got rezoned....it is the only 5 lane highway in bibb county that isn't commercial, if its considered residential then why did they install commercial huge, steel electric poles on this street. finally macon will start to grow...more businesses, more jobs...more tax revenue...we need it macon georgia thank you planning and zoning for making the best decision for this property. What a coincidence! There's a Sonya Shephard that owns 5881 Zebulon Rd, one of the parcels that was rezoned. Are you one and the same even though the last name is spelled with an a instead of an e? If you are, you are probably going to make a bundle right? Why wouldn't you be in favor? Shepherd Paving is the only property on that section that had their house for sale prior to the developer approaching them, so I understand Sonya's desire to sell. However, there were several other options presented that would have garnered the same, or more, money for the sellers without having to rezone at all and certainly wouldn't destroy our neighborhoods. Putting the desire of one person (even bumping it to 7 to include all the homeowners) over an entire community seems short sighted. Christine Amanda Yoder - Sad but it's all about the love of that almighty dollar!! The traffic on Bass Rd going and coming from this area is already congested. Next they will want to widen Bass Rd of course and it won't matter if you like it or not! If it involved developing new business downtown for oh I don't know, say, a doughnut shop perhaps... there'd be no way it would ever pass zoning! how bout some industries besides more stores!